In the 1911 Kelly’s Directory, there are three Anglican churches listed, St Peters, St James and Holy Trinity. St Peter’s was rarely used, but had been maintained. Holy Trinity was the main parish church, and could accommodate over 800 people. 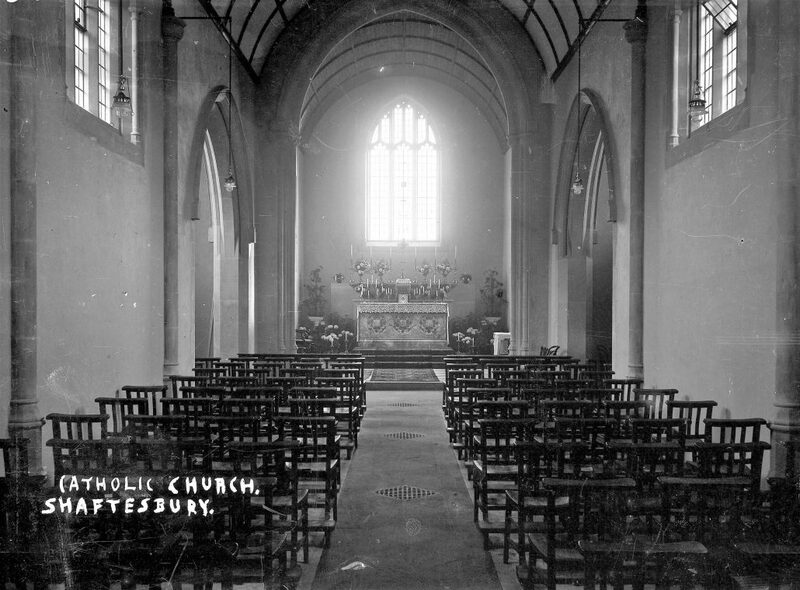 In 1908 a new chancel was added, and the Shaftesbury Pageant in 1907 was held to raise funds towards its cost. The Reverend Frederick Ehlvers was the rector from 1885 until 1915, when he was replaced by the Reverend Charles Rockett, who was also an honorary chaplain to His Majesty’s forces. 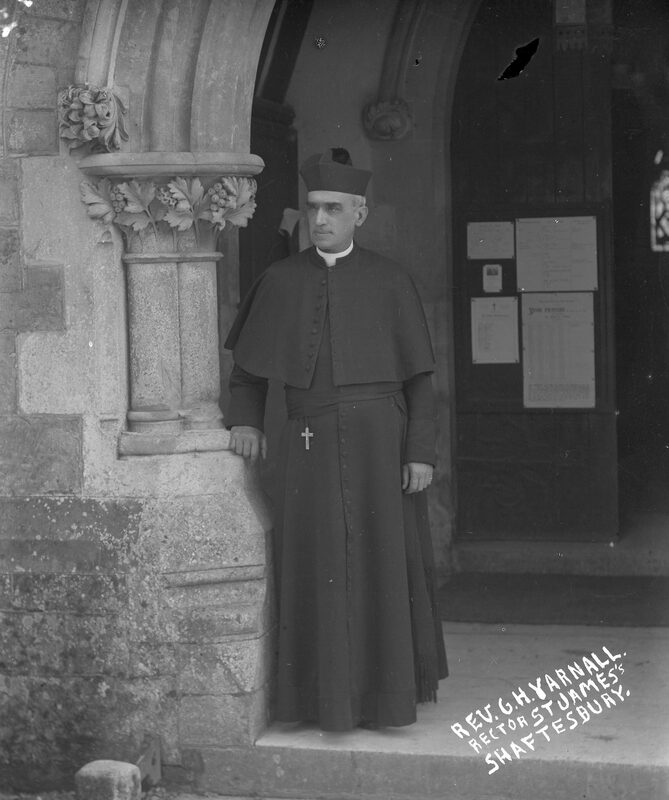 The Reverend George Yarnall was the rector of St James from 1900 to 1927. He was an American who became naturalised when he came to Britain. He was offered the living by Lord Shaftesbury who was a high churchman, and The Reverend Yarnall introduced Anglo-Catholic practices during his incumbency. He was an excellent preacher and also built up the church choir, so his congregation came from far and wide. The Angelus bell in St James was first rung during World War One to remind the faithful to pray for men of the parish who were serving at the front. In 1916 a thurible, or incense burner, was given and first used in St James, and in 1918 a statue of the Madonna and Child donated by a grateful parishioner. The Roman Catholic Church in Salisbury Street was built in 1910, and could seat 200 people. the Ebenezer Hall, an Open Brethren meeting house, Salisbury Street (built 1886). There was also a temperance hall built in Bell Street in 1878, but by 1915 it had changed its use to a Masonic Hall. As might be expected, the local churches of all denominations were involved in supporting the community both spiritually and practically. Parish magazines are good sources of information, and parish magazines for the 1914-1918 period serve as a running commentary on events and attitudes during the Great War. On July 29th the patronal festival was celebrated and the church fete held at the Rectory. It was a great success with stalls, games and afternoon tea, followed by dancing and fireworks in the evening. The Town Band played throughout the day. In September the rector encouraged young men to join up, and called for fund -raising to support the Prince of Wales Fund and the Red Cross. Church collections as usual were given to the hospital. Even at this early stage of the war, 43 men from St James had already volunteered for the forces. The rector’s monthly letters to his parishioners passionately condemn the actions of Germany and its allies, and he goes into some detail about the political events of the time. In January the Reverend Yarnall wished his congregation a Happy New Year. He noted that money was collected for Belgian children and the Red Cross at Christmas, and that St James lost its first soldier, Sidney Parsons, killed in action on December 3rd 1914. By Easter 1915, many households had taken in billeted men, some of whom attended the church. The Easter offering amounted to over £34 (worth £2,700 in 2017). In August the rector thanked his parishioners for supporting the French Flag Day, and those who sent cigarettes to wounded French soldiers. His November letter remarks “more and more of our boys have enlisted, and it would seem as ere long we would have hardly any young men in our Congregation”. This also seriously affected the choir, and other church activities. 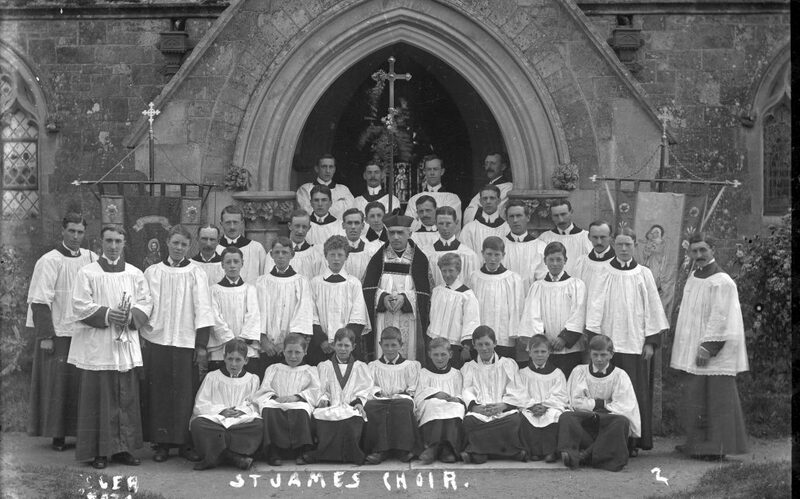 In a letter from the Front to the rector from Stan Foote, the young soldier writes of himself and another St James volunteer: “We both are very proud to think our Choir – or rather your late Choir – should be so well represented in the ranks of His Majesty’s Forces. … I am pleased to say that since we received your book on French, it has helped us a good deal”. From March the time of evening services varied to accommodate a new ruling that no lights were allowed to be visible an hour after sunset, because of the danger of attracting Zeppelins. 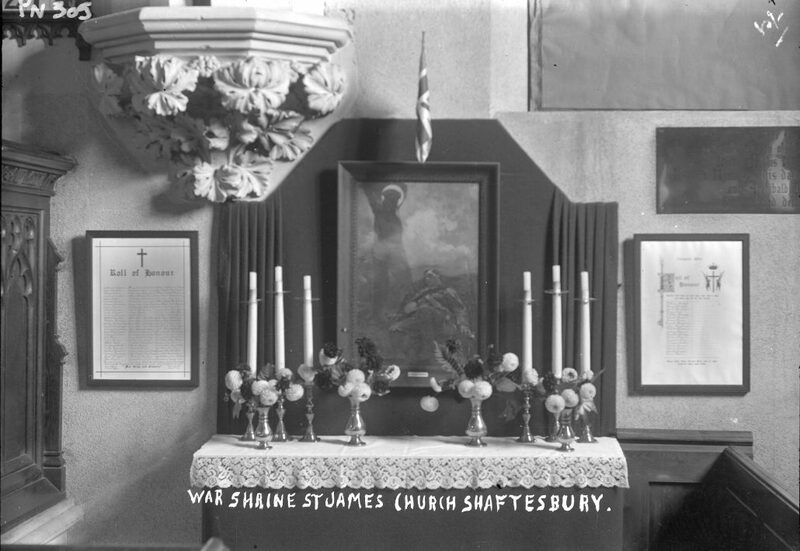 In July the Earl of Shaftesbury was already discussing a possible war memorial for St James with the Bishop of Salisbury. The rector encouraged discussion of a memorial, suggesting it might be placed on the triangle of land facing the school. The rector corresponded regularly with the serving men, and reported their letters to his congregation. In August they welcomed back Decimus Harding, one of the choirboys on leave from the Coldstream Guards. They also heard that two other choirboys, Stanley Foot and Sid Brockway, had been wounded and were in hospital in the north of England. Despite the war, many church activities carried on as before. The choir outing to Bournemouth, the first since the war started, left the “Rock” at 8.15 am and a wonderful time was had by all including swimming and a fine dinner and tea, and returning at 9.30 pm after an exhilarating day. The beaches were very crowded, with people taking it in turns to get into the water. In his January letter, the rector hopes that 1917 will mark the end of the war, but meanwhile urges his parishioners to strict economy, and to restrict ale drinking, which is wasteful and ‘has no food value whatever’. The grain would be better used to provide food. He also comments that women are the worst offenders! He acknowledges people’s generosity in the Christmas and other collections, and that they have done without presents and treats so they could support the many war charities. 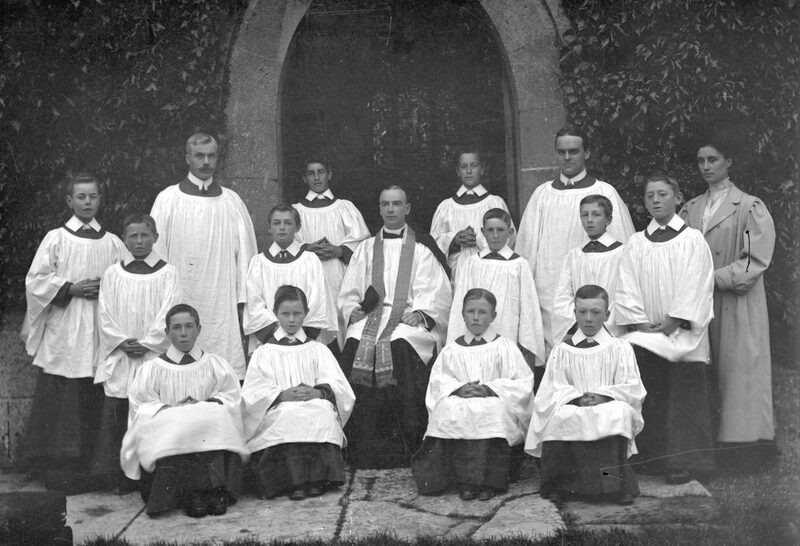 Arthur Day, one of the rector’s choirboys and correspondents, walked from Fovant camp to attend the Easter services, and on April 22nd, there was a ‘khaki procession’ comprising four serving men including Arthur, who carried the cross, banners and Union Jack. In December, the St James Roll of Honour (listing men who were serving) had 179 names, and the Roll of Glory, naming those who had died, totalled 27. In September a plea was made to help the people of Serbia whose nation had almost ceased to exist, suffering as it had from attacks from all sides. In the same month the congregation was delighted to see the return of Arthur Day to England. He had been wounded, and had spent time in hospitals in France before being moved to a prisoners’ camp in Germany. In November, eight members of the choir were still on active service, but soon they would be coming home. The parish was in the grip of influenza, with many parish activities at a standstill, and the school temporarily shut. The final Roll of Honour shows that the number deaths of men on active service had risen to 35,that is about one in six of those St James men who had served in the forces.